← Have You Had “The Talk” with Your Provider? Safety Barrier on the Golden Gate Bridge? It’s About Time! This week in the New York Times, Carol Pogash reported that the Golden Gate Bridge Highway and Transportation District is nearing agreement to build a safety net on the Golden Gate Bridge. It seems that finally, the public health hazard of the iconic symbol of San Francisco, will finally have what other previously popular suicide jumping destinations such as the Empire State Building and the Eiffel Tower have long had, a safety barrier. Safety barriers prevent suicides. The American Foundation for Suicide Prevention last year published a report that outlined the benefits — bridge barriers eliminate suicides at suicide “hot-spots”; there was virtually no increase in suicides at other nearby locations when barriers were added, and a reduction in copy-cat suicides that is correlated with less media coverage. The report also noted that these barriers were found to be a particularly useful intervention for young men. More recent studies support these claims. Are there really fewer suicides when the means of suicide are restricted? Studies have shown that indeed they are. Restriction of means for suicide was found to be effective, especially for popular, lethal, and available means (e.g. 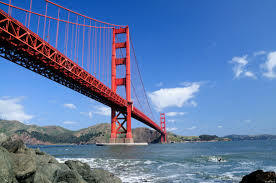 the Golden Gate Bridge) in one recent study published in The Lancet. Researcher Jane Pirkis and colleagues from the University of Melbourne published a study last year that was a meta-analysis of several studies of structural interventions at suicide hotspots. They found that these barriers decreased suicide rates in these particular locales. I hope that the Golden Gate Bridge Highway and Transportation District follow through on what is expected to happen. That they will reverse previous objections and policies against building a barrier and they will do the right thing to save lives. This entry was posted in LGBT Health, Mental Health, Public Policy, Suicide and tagged American Foundation for Suicide Prevention, Mental Health, Public Policy. Bookmark the permalink. 4 Responses to Safety Barrier on the Golden Gate Bridge? It’s About Time! I drove over the Golden Gate Bridge last week with three staff members from the American Foundation for Suicide Prevention…it’s hard to imagine what the barrier would look like. We also discussed that there is no way to know how many of those suicides are LGBT people, because death certificates collect no information about sexual orientation or gender identity. A barrier is one small piece of the multi-pronged interventions needed to end the unacceptably high suicide rate in our community. I agree with you Mickey. A safety barrier alone is not enough. We need earlier intervention, prevention, treatment, support, and we need to address broader societal issues such as joblessness, inadequate housing, poverty, violence, stigma, and discrimination. I have my psychiatric nursing students watch The Bridge documentary every semester. Although there are numerous ethical questions surrounding the movie, it documents people who jump off of the bridge and then follows up with a “psychological autopsy” through interviews with surviving family and friends. Although it is not necessarily related to LGBTQ issues, I recommend the movie to those who are interested in the subject matter of suicide. There are numerous websites that allow free viewing of the documentary — simply do an Internet search for it.